In a massive surge southward, Sherman conquers the city of Atlanta, sweeping aside the Confederate army under the inept leadership of General John Bell Hood. Pushing through Northern Georgia, Sherman’s legendary March to the Sea shoves away any Rebel presence, and by Christmas 1864, the city of Savannah falls into the hands of “Uncle Billy”. Now there is but one direction for Sherman to go. In his way stands the last great hope for the Southern cause, General Joseph E. Johnston. In the concluding novel of his epic Civil War tetralogy, Jeff Shaara tells the dramatic story of the final eight months of battle from multiple perspectives: the commanders in their tents making plans for total victory, as well as the ordinary foot soldiers and cavalrymen who carried out their orders until the last alarm sounded. Through Sherman’s eyes, we gain insight into the mind of the general who vowed to “make Georgia howl” until it surrendered. In Johnston, we see a man agonizing over the limits of his army’s power and accepting the burden of leading the last desperate effort to ensure the survival of the Confederacy. The Civil War did not end quietly. It climaxed in a storm of fury that lay waste to everything in its path. 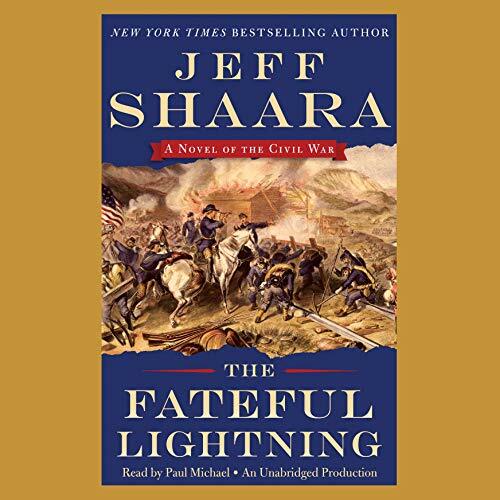 The Fateful Lightning brings to life those final brutal, bloody months of fighting with you-are-there immediacy, grounded in the meticulous research that listeners have come to expect from Jeff Shaara. This is presumably the last novel in Jeff Shaara's Civil War novels. And it is the best of the lot. The story starts with General Sherman, leaving Atlanta and beginning this march across Georgia and up the east coast. It ends with the surrender of Confederate General Joe Johnston to Sherman in North Carolina. The story centers around four individuals involved in this campaign, each becomes a distinct and real individual. The narration and production values of this audio book are excellent. because scharra take the time to research his subjects they are no longer bullies or monsters and it is a credit to his writing that Sherman is no longer the scourge that history would have you believe he was. I am a big fan of Jeff Shaara's Civil War novels, having read his Dad's "The Killer Angels" and his "Gods and Generals" and "The Last Full Measure". I chose to listen to the four books that cover the "western" theater of the war and was very happy with the narration of Paul Michael. It was particularly good that Mr. Michael performed all four books, keeping continuity of the story and making transitions between volumes almost seamless. If you're interested in the Civil War and aren't already familiar with Mr. Shaara's work this is an excellent way to get acquainted. Excellent wrap up of the Civil War! Takes you thru the end and again gives a good summation of the where, what and how of this time. Good conclusion of the western battles and logic to Sherman's methods to end this conflict. similar to others in series, but still good. tough to distinguish between these at some point. Despite the fact that this Civil War Series by Mr. Shaara is fictional,the historical content is top notch and even ardent historians will find it informative and well researched. The reader is great too. Great collection. Fascinating, unable to put it down. The insight into the campaign and the personalities of the conflict are illuminating. Great performance. This is last civil war novel that jeff wrote. It is like all the others he wrote the historical events are accurate but added the conversations with the characters in the first person makes it very interesting. Paul Michael does this entire series justice with his wonderful voice. His portrayal of Sherman and Grant is so well done I honestly felt like I got to know the real men. I'm going to miss this series and I'll likely go through them all again in the future.